Natural Aloe Ferox hand and body care products with active plant botanicals. Changing seasons usually demand a change to your skin care routine. In winter with plummeting temperatures and indoor heating a richer formulation is usually needed. In summer a lighter product usually does the trick. 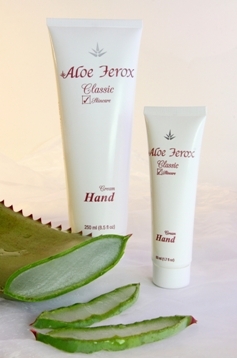 Aloe Ferox Hand and Body Lotion is light yet effective. Smooths and softens your skin. Absorbs quickly with a lingering fresh fragrance of geranium. Ideal for warmer summer months. 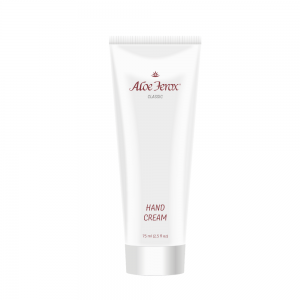 Aloe Ferox Hand Cream is rich and deeply hydrating. The natural ingredient, aloe, is quickly absorbed with a silky ‘after-feel’. Skin is instantly softer and more comfortable. Never greasy. If you tend to have dryer, ashy knees or elbows, dab on a bit of cream for long lasting moisturising. Available in a convenient, travel friendly small size or a larger size. To protect your skin when you are out and about, Aloe Ferox Super Aloe Gel provides an invisible barrier. If you’ve had too much sun, it is a natural after-sun care product. And if you’ve been lucky enough to climb the hills, hit the ski slopes and are a bit wind-burned, a sweep of aloe will get your skin restored in next to no time. If you like a glossy finish, choose Aloe Ferox Tissue Oil. It is remedial if you have any skin damage that is likely to lead to scarring. Thanks to its unique blend of active aloe and five other natural oils it helps to promote the repair of skin tissue and restore elasticity. If you have psoriasis or eczema you may find that Aloe Ferox Whole-leaf Gel provides you with some relief from itchy, dry, flaky skin. A soothing formula comprising the active plant ingredient Aloe Ferox, avocado oil, sweet almond oil and evening primrose oil. Aloe Ferox Cel-u-lite Gel is a blend of herbs such as Aloe ferox, Ginger, Gotu Kola, Horsetail and Guarana. Apply regularly to address the orange-peel effect of cellulite. How to look younger for longer, naturally. How to improve acne scars at home. Natural ways to treat your acne at home. Eat your way to a clear complexion. 'Out of Africa'. Aloe Ferox grows wild - and organically in the Cape, South Africa. Aloe Ferox is a pharmacy in a plant with over 130 medicinal compounds. Natural. Healing. Anti-inflammatory. Anti-fungal. Anti-bacterial. Regenerating. Deeply hydrating. And 20 x stronger than Aloe Vera. Think what it can do for you. NATURALLY DOES IT Natural treatments for; acne, arthritis, IBS, psoriasis, eczema, stress, anti-ageing, prostate, improved sexual performance, menopause, chronic constipation, digestion, rosacea, weight management and more. Safe. Natural. Free from steroids. Brexit is on pause, for a while. European customers should ensure they have stock as there are likely to be delays with exports. If you live in the city – take a walk in the park to be well and stay well. We are a small independent retailer based in Doune, Scotland. Our specialism is skincare, haircare and general wellbeing products made from Aloe Ferox. We ship our products to customers around the world and we accept payments with Credit & Debit card via PayPal.